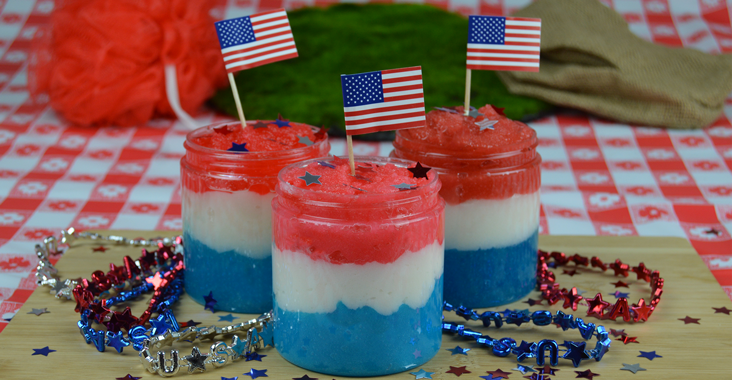 What’s not to love about a patriotic, red, white, and blue sugar scrub? They are festive, colorful and sure to be perfect hostess gifts to bring to those July 4th cookouts! This tutorial demonstrates how extremely easy they are to make. Surprisingly enough, the colors don’t bleed, resulting in a uniform layered look. For fun, we will be using fragrances that remind us of the old ice cream truck rocket pops. As a base, you will need either our Glowing Skin Sugar Scrub or our Sugar and Shea Body Polish depending on which grain you prefer. Glowing Skin uses granulated sugar and Body Polish uses fine grain sugar. Both scrubs work equally great in this recipe. Split your sugar scrub into 3 portions. Start with coloring the first batch blue and then add the fragrance blazin’ blueberry. Mix it well and set it aside, this will be the bottom layer of scrub. Then color the second batch with the titanium dioxide solution and add the margarita lime fragrance. Mix it well and set aside, this will be the center layer of scrub. Finally, color the last batch with the cherry colorant and add the watermelon lemonade fragrance oil and mix well. This will be the top layer. You can carefully spoon in layer by layer and smooth it out as you go. Or you can pipe it in the jar and gently tap it on a table to level. The titanium dioxide solution helps prevent the color from bleeding into one another. 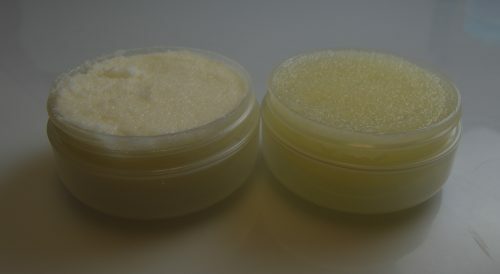 And the titanium dioxide makes the sugar scrub more opaque and white. Rest assured the titanium dioxide solution is harmless. The powder is dissolved into the solution so there is no risk of breathing in the powder. When using the titanium dioxide solution, be sure to shake up the sealed bottle just in case the color settles. Scenting the scrub with a single fragrance will work just as well.